I can no longer help you with matching a missing banjo hook or nut. I have no Gibson parts at all; I will post anything I have available. 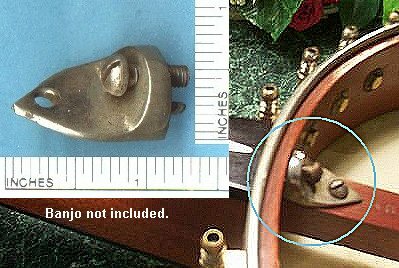 Banjo Wrenches Banjo Parts Mandolin Parts Ukulele Parts Figures, etc. 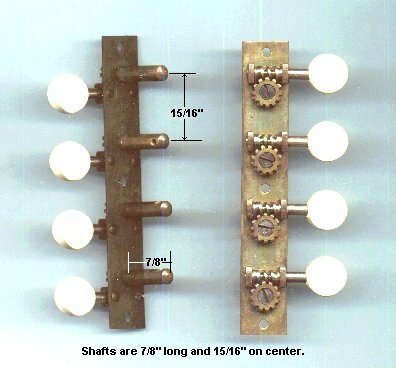 Note: The boxes containing the named banjo wrenches and some of the ivory and bone tailpieces, originally listed here, are missing -- whether just mislaid or misappropriated is not known at this time. Please check back from time to time to see if they have been found. All the vintage tuners have been sold. 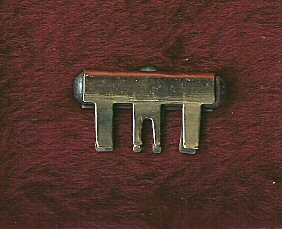 Cubley Tailpiece, circa 1880s, Sold. Waverly Long Pattern, slide on cover, very good condition, $100. 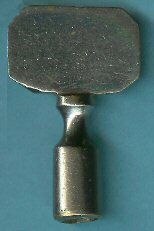 A.G. Wood with attachment screw, exc. condition, (middle one in picture) $150. No Knot, Cammed, orig. 5 string, early, rare, near mint, marked Patent Pending, $250. No Knot, Non-cammed Original 5-string, marked Pat. Nov. 19, 1901, $150. No Knot, Non-cammed Original 4-string, marked Pat. Nov. 19, 1901, $150. Heavy cast brass same shape as Skinner, but unmarked, $50. Generic round handle, complete set of 3, (1/4",9/32",5/16"), $25. Generic round handle - 5/16", $10. Generic with heart-shaped handle #10, 9/32", $35. Generic with pointed, spade-shaped handle #11, complete set of 3, (1/4",9/32",5/16"), $75. Generic with pointed, spade-shaped handle #11, 1/4", $25. Generic with pointed, spade-shaped handle #11, 5/16", $25. Club-shaped, 3 holes #12, 5/16", $35. Vintage Nuts, Shoes & Hooks -- limited quantities. Bacon, B&D, Gretsch. Chrome plated, perfect condition, 6 flat hooks & 3 nuts, $5 each. Ode 5/16" nuts, solid aluminum (unplated), perfect condition, $10 each. Antique Banjo or Fiddle Mute. Stamped Elton on top. Fits on the bridge, 4 or 5 strings. Solid, polished, brass. $100. Weymann Neck Adjuster, exc cond, 10 3/8" tip to tip, $55. Weymann Neck attachment yoke, $35. 1930s Flange set, incomplete, missing one end piece and 2 regular pieces, $25. Vega armrest, gold plated, plating is pretty good, metal is excellent, star stamp, $100. Dunlop? Toggle Capo, adjustable, non elastic, like new, black, $5. 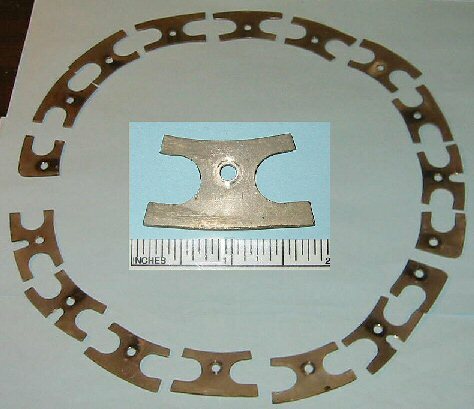 Flesh hoops, 11", 10 15/16", 11 13/16", Vega square cross section. Very good condition, $25 each. Vintage Mandolin Tuners, late 20s & 30s, plain, brass plates, 15/16th centers, white celluloid buttons, v gd. $100. Chromatic Pitch Pipe, slide the guage to change notes, exc, w/orig tin litho box, . 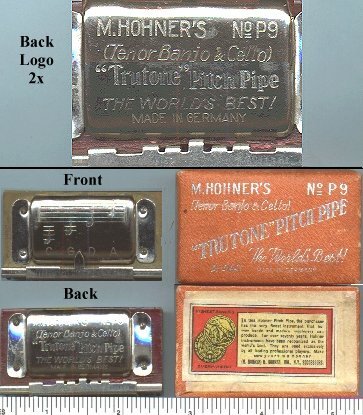 Hohner Trutone Pitch Pipe, like small harmonica, for tenor banjo & cello, exc, w/orig box, $50. 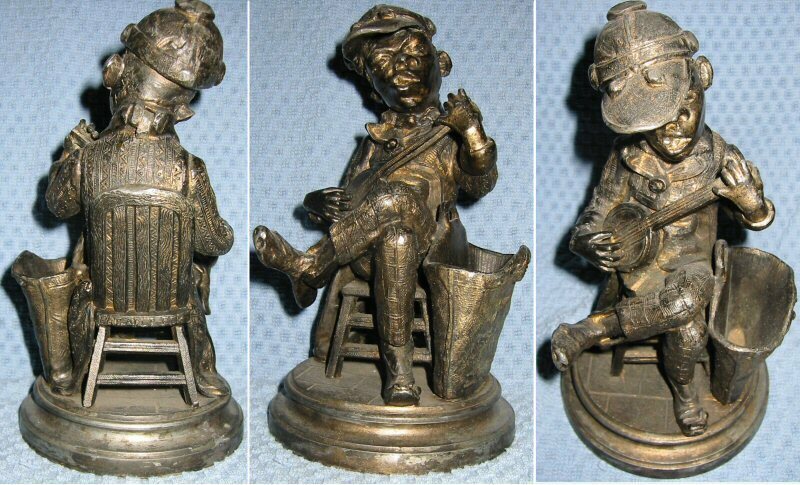 Antique Black Jockey Banjo Player. Figure is called a "smoker" is damaged but fixable. Perfect ones have sold for ~$2000. As is, $550. 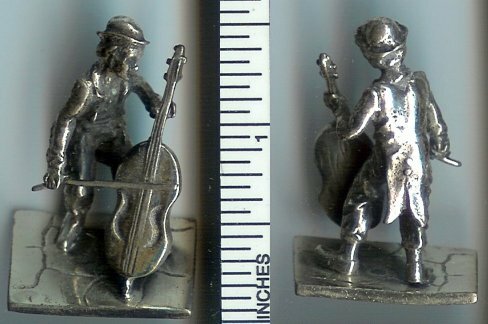 Man Playing Bass Fiddle, great detail, silver, $75. 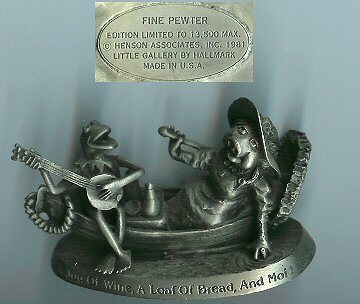 Miniature injection molded musicians, from around the world. My understanding is there is one from every country in the world (at that time); I gave up after 4. $10 for all 4, only!